“This constitutional amendment will strengthen Labour and make it more democratic and more electable” I would just ask how? How many voters will know of the proposed change, and if the candidate is changed, are you going to publicise the reasons and if so what if the electorate do not agree and vote for someone else. Finally, I believe that any sitting MP who is not selected will stand as an Independent meaning that in all probability the vote will be split and the seat will be lost. After living in Brussels for many years and have only been back for less than two years (about the same as I joined the LP), I’ve often wondered how the PLP could be so hostile to Jeramy Corbyn. I believe that your efforts to make the LP more democratic is absolutely correct. I go along with the above, not before time, we brought true socialism back to the people who own it, the salt of the earth who slaved under squalid conditions, living in slums, working for pennies to keep their heads above water. We find ourselves slipping back there, under yet another right-wing Tory Party! Thatcher is the one who started this country’s decline backward, 18 years of destroying its infrastructure! Putting millions out of work, destroying our climb out of poverty, that we, the workforce, struggled long and hard, fighting for better conditions, wages and a shorter working week! All that struggle to make our lives better was taken away! Now for the first time in my long life, we have a Leader in Jeremy Corbyn along with our MPs who back him, we the members and those Labour voters will make this country a better place for everyone, not just the rich! Somewhere, we can all live together, without fear or prejudice. In response to Paul Salts comment there are a couple of points worth making. 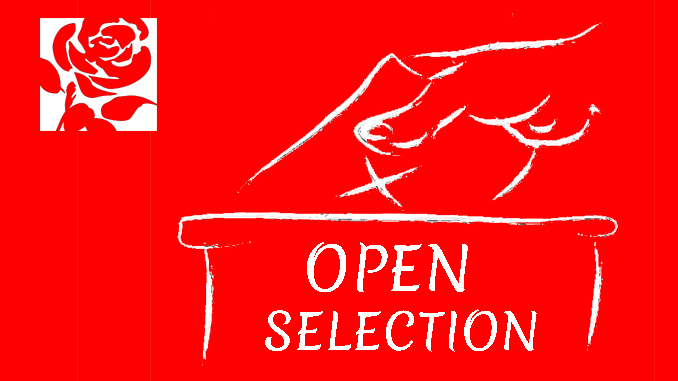 The first is that the selection of candidates is the first stage in the democratic process. It is right that members of the local Labour Party choose their candidate. In turn it is more likely that they will turn out to work for a candidate they have chosen in the run up to and the aftermath of an election. This is the norm across most political parties in the UK and Europe. Labour and the Tories are the exception rather than the rule. In elections the majority of votes are cast for a party rather than a specific person. The combination of popular local candidates with the local parties behind them definately improves democracy and electability. We don’t see a slew of Independents standing because they were not selected by other parties and there is no reason to suppose Labour will be any different. Deselected MP’s standing as an Independent ? Well the majority of voters, vote for the rosette not the person wearing it. How do you think Dennis McShane kept getting voted in, in Rotherham. Do you really, hand on heart, think that the likes of Kinnock, Umunna, Phillips et al would do well without the red banner behind them. If you Don’t believe me, why haven’t the broke away as some keep threatening. Just think SDP, it doesn’t work overall. The MPs Colin mentions all adhere to socialist values and are part of the Labour Party. I don’t think many voters look only at the Party colours but at the person wearing them & what they say. Quality people suggest quality and few Tory’s do.